Vilnius/Vilna-The Simon Wiesenthal’s Director for Eastern Europe, Holocaust historian Dr. EfraimZuroff, met late last week with Prof. ArunasGumuliauskas, Chairman of the Seimas “Committee on National Memory” and two of his advisors in an effort to convince them to cancel their initiative to declare 2018 as the year to honor a Lithuanian anti-Communist partisan who commanded a unit of local insurgents who committed Holocaust crimes. AdolfasRamanauskas (“Vanagas”) was the leader of the local Nazi collaborators in the town of Druskininkiai in southern Lithuania, who persecuted the Jews of that community during the initial weeks following the Nazi invasion of June 22, 1941. At the meeting, Zuroff presented research and documents by Lithuanian journalist EvaldasBalciunas, which are publically available on www.defendinghistory.com, and which clearly point to Ramanauskas’ role as a leader of the pro-Nazi Lithuanian insurgents who actively persecuted Jews and Communists in the town in June and July 1941. Any participation in these crimes, Zuroff argued, should automatically disqualify a person from being declared a national hero. The decision of the Seimas must go through eight different stages before it is approved, and five have already been completed, in each case by unanimous vote. WIESENTHAL CENTER: LITHUANIAN MILITARY EXERCISES AT HOLOCAUST MASS MURDER SITE "TOTALLY INAPPROPRIATE"
Jerusalem-The Simon Wiesenthal Center today issued a statement harshly condemning military exercises being held by the Lithuanian Army at the Seventh Fort in Kaunas (Kovno), the site of the mass murder of several thousand Jews in July 1941. In a statement issued here by its director of Eastern European Affairs, Dr. Efraim Zuroff, the Center labelled the decision to conduct military training at the site "grossly insensitive," and called upon the army to immediately halt the exercises at the mass murder site and move them to an alternate venue. "The original sin in this regard was the horrendous mistake of privatizing the mass murder site by the government in 2009 over the objections of the Lithuanian Jewish community. Given the fact that the area where the victims are buried is not fenced off, nor is it appropriately marked, there is a danger of the desecration of the dead. We urge the Lithuanian authorities to acknowledge their lack of sensitivity to these Holocaust victims and immediately move the military exercises elsewhere." Jerusalem-The Simon Wiesenthal Center today sent a strong letter of protest to Kaunas mayor VisvaldasMatijosaitis regarding entertainment and amusement activities being conducted for profit at the Seventh Fort, the mass murder site of 5,000 Kaunas Jews in the summer of 1941. In his letter to Mayor Matijosaitis, the Center's Director for Eastern European Affairs, Holocaust historian Dr. EfraimZuroff called the current situation "disgraceful" and urged the mayor to immediately suspend such activities at the site. "As you no doubt are aware, the site of the mass murder of several thousand Jews in 1941 was privatized several years ago, and has now been turned into a recreation and entertainment center which violates the memory of the victims. "This sad situation was revealed already several months ago in Musiskiai, the book RutaVanagaite and I wrote about the subject of Holocaust memory and commemoration in Lithuania. More recently, a feature by Israeli journalist CnaanLipshiz of the Jewish Telegraphic Agency revealed that one could even hold a wedding reception at the site. "These revelations have justifiably aroused widespread indignation, and a call for action to put an end to this disgraceful situation. "I urge you to immediately suspend such activities at the Seventh Fort and find a way to restore the site to the municipality or to an organization whose purpose will be to honor the memory of the victims, rather than insult them." Taurage, Lithuania – The Simon Wiesenthal Center today praised an op-ed in the popular Lithuanian news portal lrytas.lt by prominent journalist VytautasBruveris calling upon the government to finally undertake a comprehensive investigation of the scope of Lithuanian complicity in Holocaust crimes. In a statement issued here today by its chief Nazi hunter, Dr. EfraimZuroff, who is currently in Lithuania on a research expedition, the Center expressed its appreciation and support for the content of the article and expressed the hope that the government would indeed implement the ideas raised by Bruveris. "This important article by Bruveris, following a recent op-ed in the same spirit by journalist RimvydasValatka (on July 26 in www.delfi.com), points to growing awareness in the circles of Lithuanian intelligentsia of the necessity to finally fully investigate the role and scope of Lithuanian collaborators in Holocaust crimes. Also of great significance is the call to stop the glorification of Lithuanian freedom fighters who actively participated in the murder of Jews during the Holocaust. These public calls for such an investigation will hopefully mark a positive turning point in the history of Lithuania's dealing with its Holocaust past and, if acted upon, will no doubt significantly help improve Lithuanian-Jewish relations." Jerusalem-The Simon Wiesenthal Center today urged AndriusKupčinskas, the mayor of Kaunas, Lithuania, to cancel the upcoming neo-Nazi march scheduled to take place this coming Monday, February 16, Lithuanian Independence Day, in the center of the city. In a letter sent today by its chief Nazi-hunter Dr. Efraim Zuroff, the Center urged Mayor Kupčinskas to find a legal basis to cancel the march, or at least have it conducted elsewhere under strict limitations against incitement and Holocaust distortion." According to Zuroff's letter to the mayor: "As you well know, once again the neo-Nazis and ultranationalists plan to march in the center of Kaunas this coming Monday, February 16 to mark Lithuanian independence day. I think that it should be obvious to you that such a march in which the main slogan is "Lithuania for Lithuanians," and numerous Lithuanian swastikas are shown along with the image of Third Reich supporter JuozasAmbrazevicius who collaborated with the Nazis in the murder of the Jewish residents of Kaunas is hardly an appropriate manner to celebrate Lithuanian independence." Jerusalem-The Simon Wiesenthal Center today sent a letter of protest to the Lithuanian Jewish community in response to the participation in yesterday's events to mark International Holocaust Remembrance Day of the Lithuanian Genocide Center and a scholar affiliated with that institution who consistently downplays the role of Lithuanians in Holocaust crimes. In a letter sent to Faina Kukliansky, the president of the Lithuanian Jewish community by chief Nazi-hunter Holocaust historian Dr. Efraim Zuroff, the Center emphasized the extremely negative role played by the Genocide Center in recording the history of Lithuanian Jewry, especially during the Holocaust and in particular its systematic efforts to minimize the highly significant role of Lithuanians in Holocaust crimes. 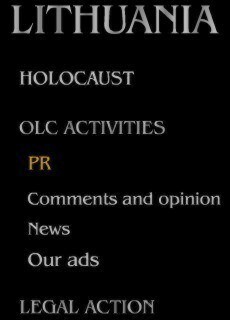 "Anyone acquainted with the history of that institution [the Genocide Center] is well aware of its very active role in rewriting the accepted and accurate narrative of World War II to the detriment of historical truth. Examples of its harmful activities abound, but suffice it to mention its responsibility for the content of the local Genocide Museum, which included blatantly anti-Semitic exhibits overemphasizing the role of Jews in Communist crimes, while completely ignoring the real genocide, that of European, and especially Lithuanian Jewry, which took place in Lithuania. Only after protests, did the museum devote one small room to the Holocaust, and in a manner unbefitting the scope and nature of that unique tragedy. To make matters worse, one of the guest speakers was Dr. ArunasBubnys, whose book on the Vilna Ghetto is a good example of Holocaust distortion designed to downplay the role of Lithuanians in the mass murder of Jews and emphasize the questionable behavior of the Jewish police who were operating under coercion in very difficult circumstances. It was Bubnys who publically denied the well-documented violence by Lithuanians against Jews in dozens of communities before the Nazis even arrived, a fact corroborated in numerous survivor testimonies. The cooperation between the Jewish community and the Genocide Center is a disgrace and a betrayal of the memory of the Jews murdered by Lithuanians. For years, Dr. Alperovich, your esteemed predecessor, courageously defended the historical truth regarding the Holocaust in Lithuania and the memory of the victims, but that clearly is no longer the case, and the community under your leadership has forfeited its role as custodian and guardian of Shoa memory." Jerusalem-The Simon Wiesenthal Center issued the following statement in the wake of the passing last night of Dr. Shimon Alperovich, the former Chairman of the Lithuanian Jewish community. "It is with great sorrow that we learned of the passing last night of Dr. Shimon Alperovich, the < venerable leader for many years of the Lithuanian Jewish community. Dr. Alperovich displayed great courage and fortitude in leading the renewed Lithuanian Jewish community and fought bravely against the ongoing efforts to minimize local participation in Nazi crimes and the promotion of the canard of equivalency between Nazi and Communist atrocities. "Just two and a half weeks ago, I visited him in Vilnius together with Prof. Dovid Katz, to update him on our plans to protest the next day against the neo-Nazi march held in the capital, and Dr.
Alperovich gave us his blessing and encouragement. "On numerous occasions, Dr. Alperovich publically spoke out against Lithuanian Holocaust distortion and, unlike some other Jewish leaders in Eastern Europe, fully supported the Center's "Operation Last Chance" (launched in Lithuania in July 2002) and our efforts to persuade the local authorities to bring unprosecuted Lithuanian Nazi criminals to justice. "May his memory be a blessing to his family, the Lithuanian Jewish community and Litvaks the world over." Kaunas –The Simon Wiesenthal Center's Israel Director and chief Nazi hunter Dr. EfraimZuroff yesterday afternoon led a protest against an ultra-nationalist neo-Nazi march in honor of Lithuanian Independence Day, held here, in Lithuania's inter-war capital, whose large and important Jewish community was virtually totally annihilated during the Holocaust by the Nazis, with highly significant participation of Lithuanian volunteer collaborators. The Center's delegation, which also included world-renowned Yiddish professor Dovid Katz, noted Lithuanian film-maker SauliusBerzinis, and leading Jewish community activist Milan Chersonsky, was joined by more than two dozen local anti-fascist demonstrators led by Lithuanian journalist EvaldasBalciunas, who has written extensively (www.defendinghistory.com) about Lithuanian efforts to glorify Holocaust perpetrators. In his statement to the media, Dr. Zuroff emphasized the use by the demonstrators of the image of JuozasAmbrazevicius-Brazaitis, who served as prime minister of the Lithuanian provisional government established in Kaunas shortly after the Nazi invasion, and which enthusiastically supported the Third Reich and the systematic annihilation of Lithuanian Jewry. "Those who seek to inspire patriotism by invoking the memory of Ambrazevicius-Brazaitis are in effect expressing support for the tragic annihilation of Lithuanian Jewry. In that context, the shouts of the demonstrators "Lithuania for Lithuanians", ring starkly ominous. The consistent refusal of Lithuania's political leaders to condemn such behavior will only encourage the growth of the extreme right in a country where professed patriotism led to massive collaboration in Holocaust crimes." Jerusalem – The Simon Wiesenthal Center today harshly criticized the results of a study on Lithuanian participation in Holocaust crimes recently completed by the government-sponsored Center for the Study of the Genocide and Resistance of Residents of Lithuania. In a statement issued here today by its chief Nazi-hunter, Israel director Dr. Efraim Zuroff, the Center noted two major flaws in the findings of the report as presented by its coordinator Dr. Alfredas Ruksenas, in a report published by the Lithuanian news portal www.delfi.lt on October 25, 2013. "The findings of the report, as presented by the coordinator of this project, are clearly part of a systematic attempt by the Lithuanian government to minimize the role of ethnic Lithuanians in the mass murder of Jews during the Holocaust. Based on the records in our archives, I can unequivocally state, that the figure of 2,055 Lithuanians whose direct and indirect participation in Holocaust crimes was confirmed by this study, is a gross underestimate of the number of Lithuanians complicit in Shoa crimes, designed to deflect blame from local collaborators and hide the extensive scope of Lithuanian involvement in the mass murder of Jews, both in Lithuania and outside her borders. "Also highly objectionable is the assertion by Dr. Ruskenas that those Lithuanians who indeed murdered Jews really had no choice but to do so, having received orders to commit murder from their superiors. Besides the fact that in many cases, these superiors were themselves Lithuanians, such arguments have been consistently and unequivocally rejected by courts all over the world, starting with the Nuremberg Trials." Vilnius-The Simon Wiesenthal Center today called upon the Lithuanian authorities to ban the neo-Nazi marches scheduled to take place tomorrow (February 16) in Kaunas and on March 11 in Vilnius to mark Lithuanian independence day. At a press conference hosted here today by the Center's chief Nazi-hunter, Israel director Dr. Efraim Zuroff, together with leading Vilnius activist Prof. Dovid Katz.www.defendinghistory.com) , the two presented the case for banning the marches which since 2008, when initially held, have blatantly incited against the country's minorities, and especially against the small local Jewish community. Zuroff presented a historical survey of the rise in anti-Semitism following Lithuania's acceptance into the European Union and NATO, which was followed by its failure to punish any of the numerous unprosecuted local Nazi war criminals tried in Lithuanian courts, and a campaign to put on trial several Jewish anti-Nazi Soviet partisans on trumped up charges of war crimes. Since 2008, the Lithuanian authorities have led the efforts to promote the canard of historical equivalency between Communist and Nazi crimes and have glorified various nationalists who actively participated in the persecution of Lithuanian Jewry during the Holocaust, all of which help explain the resurgence of fascist ideology and extremist nationalism as manifested in the marches. "The best way to combat the resurgence of right-wing nationalist extremism in Lithuania is to honestly confront the country's Holocaust history, which includes extensive complicity of local Nazi collaborators in the mass murder of Lithuanian Jews and Jews from, and in, other lands as well. The country's failure hereto to accurately and honestly portray the role of all sectors of Lithuanian society in Holocaust crimes, is the background and a key factor in the rise of ultranationalism in Lithuania. Instead of telling the painful truth about Lithuanian crimes, in recent years the government preferred to turn some of the criminals into heroes and downplay the uniqueness of the Holocaust." Penktadienį, vasario 15 d., 11.00 val. naujienų agentūros BNS spaudos konferencijų salėje adresu Jogailos g. 9/1, Vilnius, Simono Wiesenthalio biuro Jeruzalėje direktorius dr. Efraimas Zuroffas bei tinklapio www.defendinghistory.com įkūrėjas ir vyriausiasis redaktorius prof. Dovidas Katzas rengia spaudos konferenciją dėl Vasario 16-ąją Kaune, kovo 11-ąją Vilniuje ir kovo 16-ąją Rygoje numatytų nacionalistinių eitynių. Jerusalem-The Simon Wiesenthal Center today strongly condemned a neo-Nazi march held late last week in the city center of Kaunas (Kovno), Lithuania’s second-largest city and its interwar capital. In a statement issued here today by its chief Nazi-hunter, Israel director Dr. Efraim Zuroff, the Center called the demonstration “a disgraceful way to observe Lithuanian Independence Day,” and harshly criticized the public support of the march by five Lithuanian members of parliament, and the total absence of any public criticism by Lithuanian elected leaders or officials or foreign ambassadors. “A march of several hundred primarily young people wearing white armbands with Lithuanian swastikas and other fascist symbols sends chills down the spines of the small remnant of Kaunas’ once-thriving Jewish community which was totally decimated during the Holocaust. Jerusalem – The Simon Wiesenthal Center today responded with dismay and consternation to a communication from EU Ambassador to Afghanistan Vygaudas Ušackes to its chief Nazi-hunter, Israel director Dr. Efraim Zuroff, following his criticism of an op-ed by Ušackes in the Wall Street Journal in which the ambassador referred to the Nazi occupation of Lithuania as “a few years’ respite from the Communists.” In a statement issued here today, the Center noted that rather than rectifying his grossly insensitive remark about the Holocaust, Ambassador Ušackes has again insulted its victims, especially those murdered in his homeland. “All Ambassador Ušackes was expected to do was to admit that his original comment was inappropriate and apologize for his lack of sensitivity to the fate of Lithuanian Jewry during the Holocaust. Instead, he chose to defend his callous indifference to the murder of some 212,000 Lithuanian Jews during the Nazi occupation, by complaining about the imbalance in public opinion between “Nazi crimes which have been universally condemned by all civilized humanity,” and “the crimes of Stalin’s regime…and the tragedy of its victims,” which only received recognition more recently, as if this justifies ignoring the Holocaust. And while he did condemn Holocaust crimes in general, he did not say a word about those committed by Lithuanian Nazi collaborators. so-called “Lithuanian heroes,” whom he exposed as participants in Holocaust crimes. In a statement issued here today by its chief Nazi-hunter, Israel director Dr. Efraim Zuroff, the Center noted the significance of Yad Vashem’s decision in the context of the ongoing battle being waged against the Lithuanian government’s energetic efforts to hide and/or minimize the active complicity of Lithuanians in the mass murder of Jews, as well as its promotion of the Prague Declaration which seeks to establish a historically-false equivalency between Holocaust and Communist crimes. Jerusalem-The Simon Wiesenthal Center today harshly criticized the Lithuanian government for trying to hide or minimize the highly-significant role of local Nazi collaborators in Holocaust crimes and attributed last weekend’s desecration of the memorial at Ponar, the site of the mass murder of 70,000 Jews during the Holocaust, to the falsification of World War II history by local historians with governmental sponsorship and support. In a statement issued here today by its chief Nazi-hunter, Israel director Dr. Efraim Zuroff, the Center pointed to the denial at a recent international conference sponsored by the government at the Seimas [Lithuanian Parliament] of the lethal violence launched by Lithuanians against Jews in at least 40 different locations before the arrival of Nazi troops, as an example of the continuing efforts by the authorities to try and conceal the active participation by Lithuanians in the mass murder of Jews during World War II. Jerusalem – The Simon Wiesenthal Center today called upon the Lithuanian authorities to refrain from honoring the “Lithuanian Activist Front” which sought to reestablish Lithuanian independence following the Nazi invasion of the country launched seventy years ago on June 22, 1941. In a statement issued here today by its Israel director, Holocaust historian Dr. Efraim Zuroff, the Center noted the vicious incitement against the Jews of Lithuania by the Lithuanian Activist Front prior to the invasion and their appeal for Lithuanians to take measures on their own against Jews considered suspect of betraying the country. These calls, it should be noted, led to widespread physical violence which claimed the lives of at least hundreds of Jews by local vigilantes, before the arrival of the Nazis in at least forty different locations. Jerusalem-The Simon Wiesenthal Center today called upon the Lithuanian authorities to make every possible effort to apprehend and punish the individuals who last night vandalized the site of the “Ninth Fort,” one of the most important sites of Holocaust mass murder in general, and in Lithuania, in particular. In a statement issued here today by its chief Nazi-hunter, Israel director Dr. Efraim Zuroff, the Center expressed grave pain and indignation that a place which currently commemorates, and during World War II had been the site of, such horrific Holocaust crimes in which tens of thousands of Jews were murdered by the Nazis and Lithuanian collaborators, was vandalized with swastikas and inscriptions calling for the expulsion of Jews, and memorial plaques were forcibly removed from their places. Jerusalem-The Simon Wiesenthal Center has labeled a neo-Nazi march of approximately 1,000 participants held this past Friday in the heart of the Lithuanian capital of Vilnius “the worst type of anti-Semitic and xenophobic incitement against Lithuania’s minorities” and harshly criticized the failure of the country’s political, intellectual, and religious leadership to condemn the march unequivocally. In a statement issued here today by its Israel Director, Holocaust historian Dr. Efraim Zuroff, the Center called upon Lithuanian elected officials to denounce such demonstrations and upon the leaders of the ruling Homeland Union party to sanction their MP Kazimieras Uoka who was among the marchers. Holocaust denier Petras Stankeras and the failure of the Lithuanian prosecutors to publicize the decision. In a statement issued in Jerusalem by its chief Nazi-hunter Israel director Dr. Efraim Zuroff, the Center noted the constant failure since independence of the Lithuanian judiciary to punish Lithuanians who commit crimes related to the Holocaust. Background: The November 16 issue of the popular news weekly Veidas published an article by Interior Ministry specialist Petras Stankeras in which he called the Holocaust a "legend." The Wiesenthal Center called for his prosecution under a Lithuanian law which makes the denial of Holocaust crimes a criminal offence. An investigation was initiated against him, but we recently learned that no charges had been filed against him, and Stankeras, who had resigned from his post under pressure from the Center and seven European ambassadors who had also protested against his denial of the Shoa, had applied to be reinstated to his original job. Jerusalem-The Simon Wiesenthal Center today harshly criticized the decision of the Vilnius Municipality to permit a march by local neo-Nazis and ultranationalists through the center of the Lithuanian capital this coming March 11, to mark the restoration in 1990 of Lithuanian independence. In a statement issued here by its chief Nazi-hunter, Israel director Dr. Efraim Zuroff, the Center noted the racist, anti-Semitic, and xenophobic slogans and signs of the participants in last year’s march on the same day, and called upon the local authorities to change their misguided decision. Jerusalem – The Simon Wiesenthal Center today called upon the Lithuanian government to prosecute Lithuanian Ministry of the Interior senior specialist Petras Stankeras, who called the Holocaust a “legend” and denied the murder of six million Jews in an article he published in the November 14 issue of the news weekly Veidas. In a statement issued here by its Israel director, Holocaust historian Dr. Efraim Zuroff , the Center welcomed Stankeras’ resignation today, but noted that Holocaust denial is a criminal offense in Lithuania and urged the implementation of the law in this case for the first time ever. Jerusalem – The Simon Wiesenthal Center today called upon Jews of Lithuanian descent (Litvaks”) the world over to boycott a new initiative announced late last week by Lithuanian Prime Ministry Andrius Kubilius to create a “Litvak heritage forum.” In a statement issued in Jerusalem by its chief Nazi-hunter, Israel director Dr. Efraim Zuroff, the Center accused the Lithuanian government of trying to enlist Jewish support for its ongoing campaigns of Holocaust distortion and promoting a false equivalency between Communist and Nazi crimes. “The creation of a new “Litvak Forum” is merely the latest in a long line of Lithuanian governmental initiatives to promote a false narrative of the events of World War II, which minimizes the extensive role of local Nazi collaborators in the mass murder of Jews and promotes the canard that Communist crimes were equivalent to those of the Nazis. Such an initiative is the equivalent of forming an Armenian support group for Turkish efforts to deny the Armenian genocide. Jerusalem – The Simon Wiesenthal Center today issued a strongly-worded protest against the decision yesterday by a Lithuanian court in the port city of Klaipeda to regard swastikas as symbols of Lithuania’s historical heritage rather than of Nazi Germany. In a statement issued here today by its chief Nazi-hunter, Israel director Dr. Efraim Zuroff, the Center called the decision “outrageous” and likely to lead to a tremendous increase in the use of Nazi symbols by Lithuania’s ultra-nationalist fascists. Vilnius – The Simon Wiesenthal Center today revealed that the recent decision by a Lithuanian court not to punish convicted Lithuanian Nazi war criminal Algimantas Dailide (number 9 on the Center’s “Most Wanted List”) was made on the basis of a medical “examination” at which he was not physically present. This fact emerged at a meeting held here late Friday between the Center’s chief Nazi-hunter Dr. Efraim Zuroff and Special Prosecutor Rimvydas Valentukevicius. Jerusalem-The Simon Wiesenthal Center today expressed a measure of relief that the fabricated case for war crimes against former Yad Vashem Chairman and Holocaust historian Dr. Yitzchak Arad was finally closed with no legal action taken, but warned that greater scrutiny was required to deal with what it termed “the far more serious problem of Lithuanian Holocaust distortion and blame deflection.” In a statement issued today in Jerusalem by its chief Nazi-hunter, Israel director Dr. Efraim Zuroff, the Center noted its grave concern over the campaign being waged by the Lithuanian authorities to create a false symmetry between Nazi and Communist crimes as part of a deliberate effort to hide the scope and extent of Lithuanian criminality during the Holocaust. “Given the woefully inadequate response by the government to the neo-Nazi march through the center of Vilnius less than half a year ago, I believe that the time has come for unequivocal, resolute and immediate action to identify and punish those responsible for this anti-Semitic attack. Jerusalem – The Simon Wiesenthal Center today sent an official protest to the Lithuanian authorities in the wake of a second investigation launched in Vilnius against a Jewish anti-Nazi partisan. In a strongly worded letter sent by its chief Nazi-hunter, Israel director Dr. Efraim Zuroff, to the Lithuanian ambassador to Israel, the Center accused the Lithuanian judicial authorities of launching a campaign to discredit Jewish resistance fighters by falsely accusing them of war crimes in order to deflect attention from widespread Lithuanian participation in the mass murder of Jews during the Holocaust. “If we add this investigation to the one currently being conducted by the Lithuanian authorities against former Yad Vashem Chairman and anti-Nazi partisan Dr. Yitzchak Arad, it is absolutely clear that a deliberate campaign is currently underway to discredit the brave Jewish heroes of the anti-Nazi resistance and help deflect attention from the infinitely more numerous crimes by Lithuanians against Jews during the Holocaust. Jerusalem – The Simon Wiesenthal Center has congratulated Jerusalem Professor Dov Levin, who today returned a military honor he was awarded in 1993 for his activities as an anti-Nazi partisan by then Lithuanian President Algirdas Brazauskas to current president Valdas Adamkus, to protest the recent decision of the Lithuanian special prosecutor to investigate fellow partisan Dr. Yitzchak Arad for participation in war crimes. In a statement issued today in Jerusalem by its chief Nazi-hunter Israel director Dr. Efraim Zuroff, the Center praised Prof. Levin for taking “an unequivocal stand against the attempts by the Lithuanian judicial authorities to delegitimize the courageous struggle of the Soviet partisan movement against the Nazis and their numerous Lithuanian collaborators. This is merely another attempt by Lithuania to minimize or relativize the extensive participation by Lithuanians in the mass murder of Jews during the Holocaust,” said Zuroff, who urged other honorees to follow Levin’s example. “As a former comrade-in-arms of Dr. Arad, and as someone who has very closely followed the efforts of Lithuanian society to erase the guilt of Lithuanian complicity in Holocaust crimes, I want to strenuously protest the absolutely disgusting demand to extradite this Jewish hero to stand trial in Lithuania. Out of a sense of solidarity with Dr.Arad and deep disgust and anger at this despicable step, which attempts to delegitimize the courageous struggle of myself and my comrades against the Nazi invaders and their Lithuanian collaborators, I hereby return the certificate of honor whose contents have been rendered meaningless by the recent actions and events in Lithuania as explained above. ירושלים - מרכז שמעון ויזנטל בירך היום את פרופ. דב לוין שהחזיר לנשיא ליטא ואלדאס אדאמקוס את אות הכבוד הצבאי שהוענק לו בשנת 1993 על ידי נשיא ליטא דאז, אלגירדאס בראזאוסקאס על מעשיו כפרטיזן שלחם בנאצים, במחאה על החלטת התובע המיוחד הליטאי לחקור את חברו לנשק, הפרטיזן דר' יצחק ארד על השתתפות בפשעי מלחמה. דר' אפרים זורוף, מנהל מרכז ויזנטל בישראל וצייד-הנאצים הראשי של המרכז שיבח היום בירושלים את פרופ. לוין על ש"התייצב בתוקף נגד ניסיונות מערכת המשפט הליטאית להפוך את מאבק הפרטיזנים הסובייטיים נגד הנאצים ומשתפי הפעולה הליטאים ללא לגיטימי. זהו נסיון נוסף לגמד את השתתפותם הפעילה של ליטאים רבים ברצח יהודים במהלך השואה," אמר זורוף, שקרא למקבלי עיטור כבוד נוספים ללכת בעקבות פרופ. לוין. "כחבר לנשק של דר' ארד וכמי שעקב מקרוב אחר מאמצי החברה הליטאית לטשטש את אשמת המעורבות העמוקה של ליטאים בפשעי הנאצים, אני רוצה למחות בכל תוקף נגד הדרישה המתועבת בעליל להסגיר את הגיבור היהודי הזה לליטא כדי לעמוד לדין. מתוך תחושת סולידריות עם דר' ארד ותעוב וכעס עמוקים כלפי צעד מכוער זה, שמנסה לשלול את הלגיטימיות מהמאבק האמיץ שלי ושל חבריי לנשק נגד הפולשים הנאצים ועוזריהם הליטאים, אני מחזיר בזאת את אות הכבוד שאיבד את ערכו בשל צעדיה האחרונים של ליטא שהוזכרו לעיל. "בהקשר זה, איני יכול להימנע מלהזכיר את זעזועי וזעמי על הפגנת מאות הניאו-נאצים שהתקיימה לאחרונה, בה הם צעדו במצח נחושה ברחובות הראשיים של וילנה האהובה שלנו, וקראו קריאות אנטישמיות כגון "יהודים החוצה" בעודם מאובטחים על ידי המשטרה המקומית, שלא התערבה למרות גילויי השיסוי הצעקניים נגד יהודים ורוסים. נראה שאין זה מקרה שהפגנה אנטישמית נוראה זו התאפשרה זמן קצר לאחר דרישת שלטונות ליטא מישראל להסגיר את חברנו יצחק ארד." Jerusalem – The Simon Wiesenthal Center today harshly criticized the manner in which the Lithuanian authorities handled a demonstration held last Tuesday in the capital of Vilnius in which hundreds of neo-Nazis marched chanting anti-Semitic slogans in the city center. In a letter sent by its chief Nazi-hunter, Israel director Dr. Efraim Zuroff to the Lithuanian ambassador to Israel, the Center demanded that the demonstrators be punished as quickly as possible, noting that public opinion poll published today in Vilnius indicated widespread public support of the march, which clearly shows that Lithuanian society in acute need of a lesson about the dangers of Nazism. “The Wiesenthal Center would therefore request that you transmit to Vilnius not only the sense of shock and outrage felt by Jews the world over, but our demand that those responsible for this outrage be prosecuted and punished in an expeditious manner. I would also add that the failure of the police to respond to the march raises serious questions about the willingness of the Lithuanian authorities to take the necessary measures to prevent such cases in the future. Jerusalem-The Simon Wiesenthal Center today expressed its concern in the wake of an anti-Semitic comment made by Lithuanian former NBA star Sarunas Marciulionis in the course of an argument with a local Jew during the recent events marking the 85th anniversary of Lithuanian basketball. Marciulionis, who claims that he was insulted by Shabtai Kalmanovich , a member of the Kaunas Jewish community, reacted by saying that “There is no place for a Jew here [at the events marking the anniversary].” Although Marciulionis later claimed that he did not understand what was objectionable about his comment, he did subsequently apologize to the Jewish community. warned that public figures, and especially sports heroes, had to be particularly careful when expressing their displeasure. “Regardless of the nature of the dispute between them, there was absolutely no reason for Marciulionis to refer to the fact that Kalmanovich is Jewish and it is clear that he used the term in a pejorative manner. In Lithuania, where basketball is the most popular sport, and outstanding hoopsters are local heroes, such comments provide legitimacy for local anti-Semitism, which in the past played a role in the mass murder of Lithuanian Jewry and continues today, on a much smaller scale, to pose a problem in contemporary Lithuania. We therefore are pleased that Marciulionis apologized and urge him to show greater sensitivity to the problem of local anti-Semitism in the future,” said Zuroff. The Simon Wiesenthal Center severely criticized the decision issued today by a Lithuanian court not to punish former Security Police operative Algimantas Dailide after it convicted him of actively participating in the persecution of innocent civilians – Jews and Poles – during the Holocaust. The Simon Wiesenthal Center totally and unequivocally rejected the dismissal yesterday by the prosecutor's office of the Kaunas District of evidence it had submitted to the Lithuanian Special Prosecutor for genocide cases regarding the participation of members of the Lithuanian national basketball team in the murder of Jews in the Seventh Fort in Kaunas in early July 1941.In a statement issued in Jerusalem by its chief Nazi-hunter, Israel director Dr. Efraim Zuroff, the Center insisted that the material presented clearly implicated the Lithuanian players and that yesterday's decision to clear all of them of any suspicion of involvement in crimes that they had clearly committed was “an unfortunate and hasty decision which reeks of misplaced political correctness.” The Center also noted that the statement issued by the prosecutor's office of the Kaunas district which referred to the testimony of Holocaust survivors and Holocaust victims as “literature” and “gossip,” is not only an affront to the memory of those murdered, but also in effect delegitimizes the accounts presented by the Holocaust's victims, which are undoubtedly among the most important sources of information on this terrible tragedy. WIESENTHAL CENTER ANNOUNCES RECEIPT OF NAMES OF 174 SUSPECTS IN LITHUANIA IN "OPERATION: LAST CHANCE;"WELCOMES OPENING OF ADDITIONAL INVESTIGATION BY LITHUANIAN PROSECUTORS AS A RESULT OF "O:LC"
The Simon Wiesenthal Center announced today in Vilnius that it had already received the names of 174 Lithuanians suspected of participation in the rimes of the Holocaust in the framework of its "Operation: Last Chance” launched in the Baltics exactly nine months ago.